You may think you have a virus on the computer, but it could be scareware. 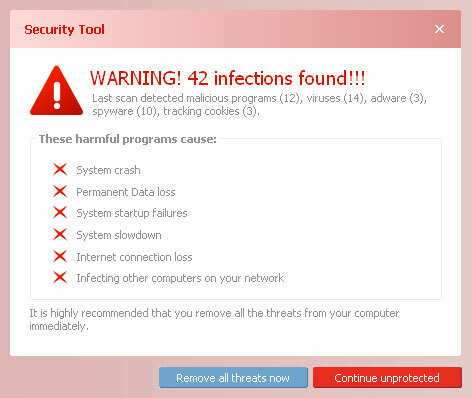 If you have a virus or scareware on your computer or laptop, it needs to be removed without delay. There is a particularly nasty rogue security software making its rounds again at the moment called Security Tool. It a form of computer malware that aims to trick users into paying for the fake removal of viruses that aren't actually there. It usually installs itself into computers via websites, particulary social networking, and websites that offer free scanning tools. This usually prevents the user from closing these windows, and also prevents the user from using the computer. This message does not necessarily mean that there is an actual virus. This programme will not scan for viruses, and it will not remove viruses. It is designed solely to trick users into giving payment details and defraud cash. These rogue antivirus programmes can be safely removed from your computer by Mat & Mouse IT Services. Please contact us for further details. "..Ian has upgraded company machines for us to ensure they run more efficiently resulting in our company becoming more efficient in itself.."
"We received a first class service in a pleasant and caring manner. Always approachable and capable of explaining matters simply to those of us who are not as computer literate as we should be!"